Make the most of the number one day to bag yourself a bargain! We’ve pulled together all of our top Black Friday deals you won’t want to miss, so you can get great gift ideas for the ones you love this Christmas, or even a little treat for yourself. 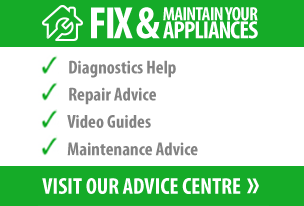 Most of the advice we give focuses on repairing your appliances rather than replacing them so it may come as a shock to see us talking about buying new appliances. There are sadly times however when appliances are broken beyond repair, or are so old so that it’s actually costing you more to run them than it is to buy a brand new machine. Modern appliances aren’t as bad as their older counterparts for guzzling energy; they’re required by law in the EU to meet certain energy efficiency standards to help the environment. But there are still steps which can be taken to improve the efficiency of your appliances. How to Avoid Ever Paying For a New Appliance Again! So you’ve got that sinking feeling. The one that comes when you pre-heat your oven only to find when you go to put your food in it’s not hot. Or when you notice a puddle under your freezer and open the door to find it’s completely defrosted. Your appliance has broken down. That’s a few hundred pounds you’ll have to stump up for replacement, not great for your bank balance or your mood! But read on and we’ll reveal some alternatives to getting stung with new appliance costs. 170 million new electrical items are purchased each year in the UK, yet as a country we recycle less than a third of these when they come to the end of their lifecycle. In fact, it is estimated that we throw away enough WEEE waste to fill Wembley Stadium six times over, every single year. No sooner had the school holidays arrived than they’re nearly over, and recent research has suggested parents are paying in excess of £400 per year to send their children back to school. And whilst we all want the best for our children, the back-to-school shop needn’t be so expensive. How Much Can You Get for 10p? What can you get for 10p? You can’t make a phone call from a public phone box, nor can you buy many products which we remember from childhood such as a Chomp chocolate bar. Instead, all you seem to be able to get for 10p today is a pack of Space Invader Pickled Onion crisps or a bag for life. Are Your Appliances Costing You Too Much? Did you know that leaving your appliances on standby each day could be costing you between £50 and £86 a year? This equates to roughly 16% of your annual electricity bill. But it isn’t just the cost of leaving your appliances on standby which could be costing you unnecessary money. Soon thousands of British motorists will be heading down to Dover to catch a ferry across to France, before spending two weeks on the Languedoc coast, exploring Bordeaux or basking in the cosmopolitan aura of Paris as part of their summer holidays.